Gent’s White 14 Karat Satin Ring Size 10 This 14k white gold wedding ring is the ideal mid-weight style with a traditional higher domed exterior profile. Curved inner edges make this style extra comfortable for everyday wear. 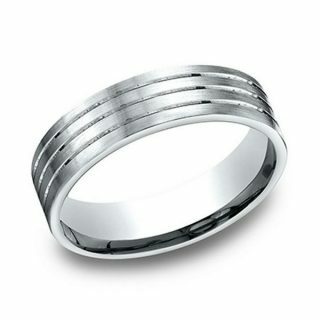 Man’s 14K White Gold Wedding Band. This wedding features a satin finish with high polish horizontal stripes. 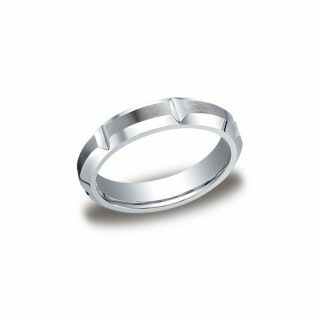 This 14 Karat White Gold 6mm comfort-fit carved design band features a satin-finished center with ingrain and a high polished round edge. A low profile and light overall weight make it comfortable for everyday wear. 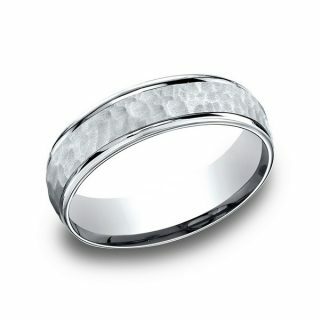 This White 14 Karat 6mm comfort-fit satin-finished carved design band features a high polished cut along the center. 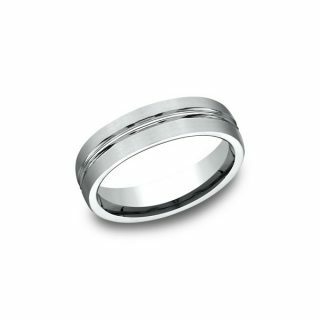 This popular 6mm comfort-fit carved design band features a satin-finished surface with a high polished round edge for noticeable style. 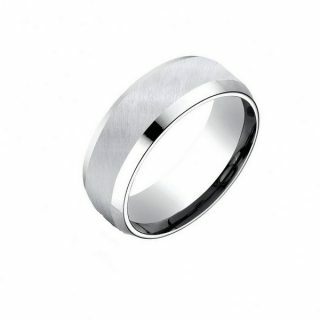 This unique high polish hammered finish creates a dimensional mirrored effect framed by rounded edges on this 6.5mm comfort-fit design ring. 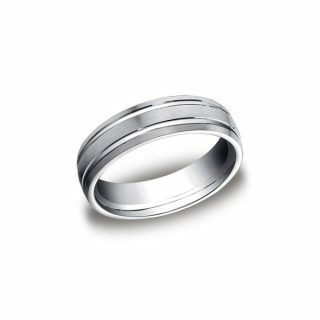 This Men’s 14 Karat White Gold 6mm comfort-fit carved design Granular band features a wired-finished center with a high polished round edge for noticeable style. 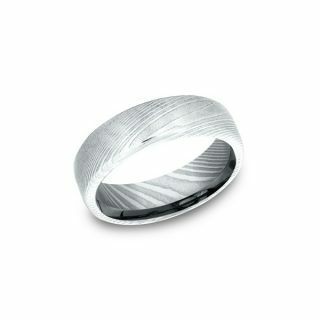 This popular Men’s 14 Karat White Gold 6mm comfort-fit carved design band features a satin-finished surface with a high polished round edge for noticeable style. This incredible black 8mm comfort-fit Cobalt band features a hammered finish with a high-polished center cut down the middle and bold round edges. Wow him with the stealthy look of this unique wedding band. Crafted in satin-finished and polished black ion-plated cobalt, this dramatic 6.0mm-wide bevel-edged style says it all. Custom-made to fit his ring size. 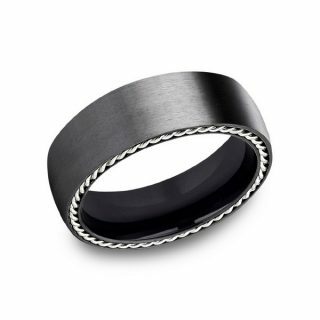 Man’s Cobalt Black Chrome Wedding Band. This incredible Black Cobalt 9mm comfort-fit satin-finished band features a high polished “stair-step” style edge. 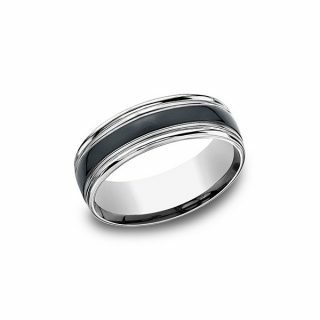 Substantial in feel, this classic wedding ring is crafted from blackened cobalt and features a satin finish. The rounded interior also ensures a comfortable fit. Black Titanium 7.5mm Band, With Silver Rope Edging. 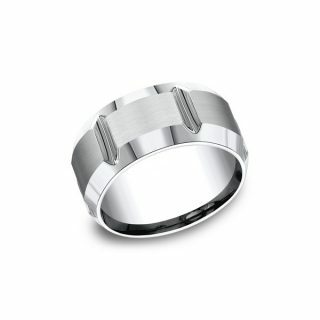 Titanium comfort-fit band features a satin-finished center and a high polished double edge. Black Titanium 9mm Band With 0.80 Ctw Black Diamonds Substantial in feel, this classic wedding ring is crafted from blackened Titanium and features a satin finish. The rounded interior also ensures a comfortable fit. This stylish 8mm comfort-fit Black Titanium band features a uniquely cut center that creates an illusion of being multiple pieces. Titanium is extremely durable, hypoallergenic and lightweight. It is a great choice for individuals who prefer a much lighter material. Titanium has a grey (gun metal) color to it. 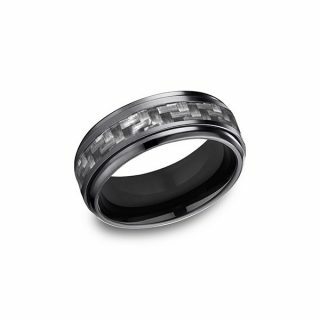 This Black Titanium 7mm Ring comfort-fit swirl brushed band features high polished Beveled edges that offers a touch of elegance. This awesome 7mm comfort-fit Tungsten band features a high-polished finish with ceramic beveled edges.This black tungsten carbide ring is perfect for every day, or as a wedding band. 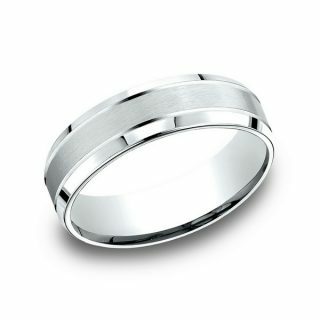 The smooth and gentle contrast of the polished beveled edge and the satin/brushed finish center is exquisite. Black tungsten rings feature an unmatched look and feelTungsten is one tough metal indeed. It happens to be (10x) harder than gold or silver, (8x) harder than platinum and (2x) as hard as steel. The name comes from the words “Tung” and “Stun” which mean “Heavy Stone” in Swedish. Though Tungsten is extremely strong and scratch-proof, the only thing stronger than it is an actual diamond. 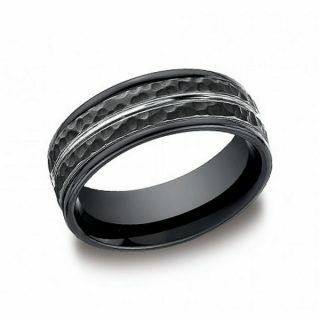 Cobalt 8mm Comfort-Fit Beveled Edge Black Titanium Riveted Inlay Design Ring. This cool high-polished 8mm blackened Cobalt band features carbon fiber as well as a comfort-fit on the inside and beveled edges. 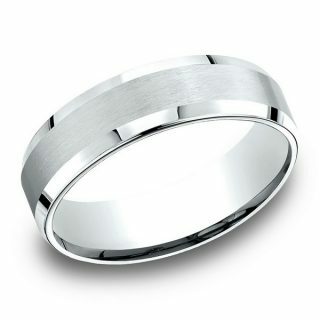 Man’s 14K Cobalt Chrome Wedding Band. 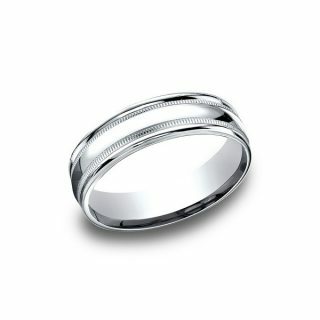 This traditional 6.5mm Cobalt band features a slight flat surface and offers Comfort-Fit on the inside comfort. Men’s awesome Cobalt 7mm comfort-fit band features small and large cross designs along the center for unForgettable style. We’ve re-imagined our classic satin finish to create a unique texture on this 8mm comfort-fit Cobalt ring. 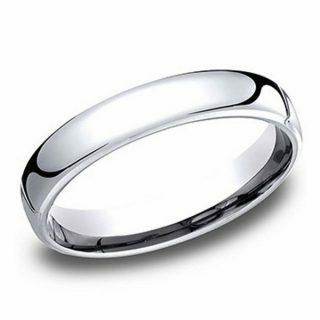 Cobalt Chrome 4.5mm Plain/High Polished Band,This ring really stands out with a rounded profile and an ultra polished finish. The Cobalt ring’s quality is unmatched and a Cobalt ring makes a great wedding band or everyday band as it is scratch resistant, will not shatter or break, is similar in color to white gold and platinum. Cobalt Chrome 5mm Band. 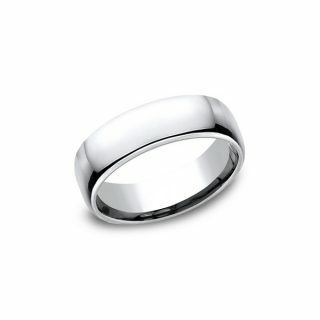 This ring really stands out with a rounded profile and an ultra polished finish. 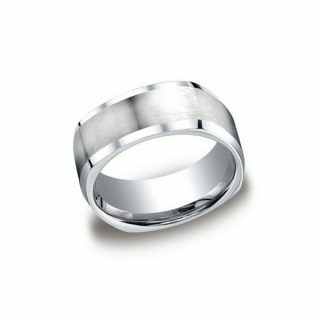 The Cobalt ring’s quality is unmatched and a Cobalt ring makes a great wedding band or everyday band as it is scratch resistant, will not shatter or break, is similar in color to white gold and platinum. 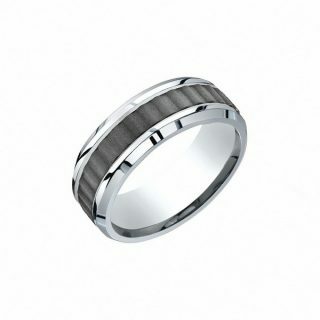 Dasmascus Steel 6.5mm Band, Size 10 Crafted of quality Damascus steel, this 6.5mm comfort fit men’s ring is ideal for the contemporary gentleman. Known for its affiliation with classic sword making, our Damascus steel is created in the United States by local artisans and is known to be a durable metal. 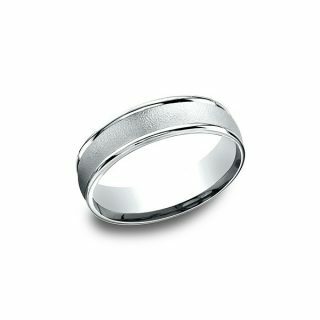 This incredible 7mm comfort-fit Tungsten band features a high-polished finish with a center inlay of ceramic and double rounded edges.